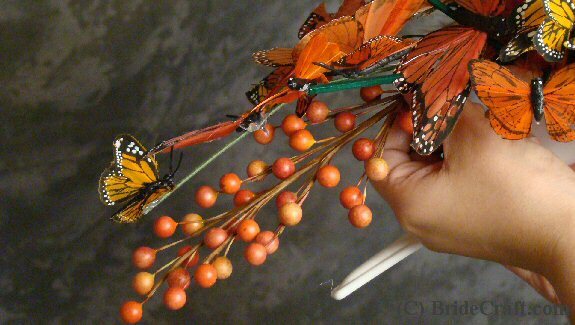 Make a Butterfly Bouquet Cascade! Do you dream of a whimsical butterfly wedding? 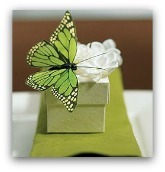 Here’s a great way to ensure that you get to have beautiful butterflies on your special day. 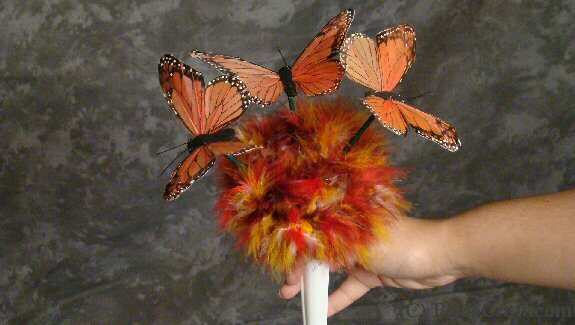 Want to know How to Make a Butterfly Bouquet just like this one? Then you're in the right place! Below you will find a step by step tutorial showing you how to do just that. 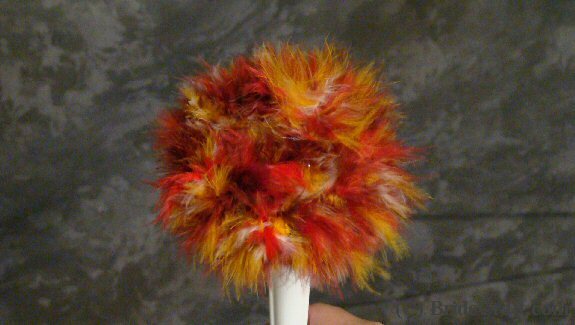 Pros: This is a completely unique bouquet. Spectacularly beautiful if done right. 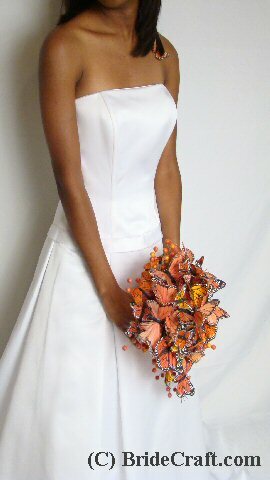 Perfect for the bride having a butterfly wedding theme. And it can be made months and months in advance! Cons: This is one of the harder projects here at Bride Craft. It takes patience and time. And sometimes singed fingers from the hot glue. It’s delicate, as well. It can get expensive buying all of the butterflies if you don‘t have a good cheap source. 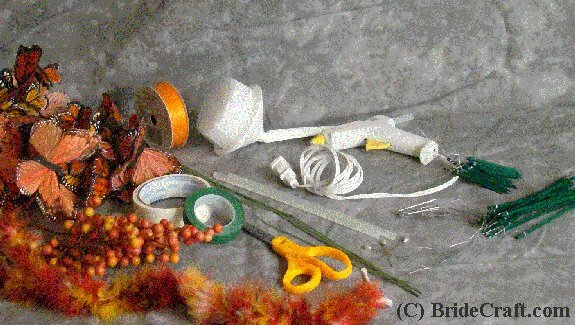 Step 1: You will need a large Styrofoam bouquet holder, a length of thin fuzzy boa, 15 to 18 large silk feather butterflies, 18 to 24 small silk feather butterflies, silk berries on a pick, double sided foam tape, florist tape (optional), fabric coated wire (optional), long florist wooden picks, short florist picks, scissors, ribbon, pearl head pins, a glue gun, lots of glue sticks, several florist greening pins…and lots of patience! 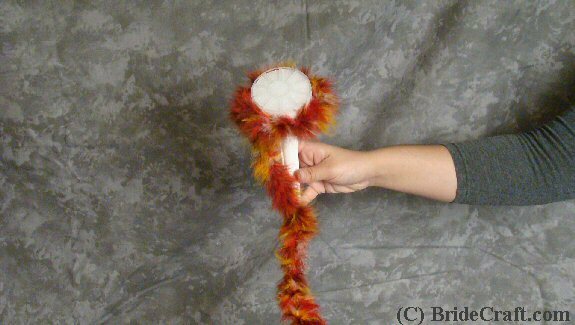 Step 2: Attach the boa to the side of the Styrofoam bouquet holder. Secure it with hot glue and a greening pin. 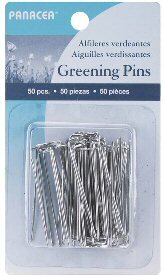 Tip: Press the greening pin flush to the Styrofoam. Step 3: Secure the boa around the sides of the holder. Your goal is to hide the white Styrofoam. Step 4: Completely cover the Styrofoam. Tip: Cover, but do not make it difficult for you to put your picks in later. Layer the boa loosely over the Styrofoam, but secure it firmly. Step 5: Glue your butterflies to the flat top of the picks. 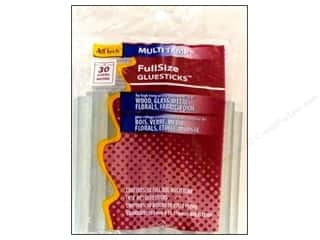 Tip A: Hot glue is awesome, but still does not always dry fast enough to keep these guys where you want them to be. Prop them in the freezer for a quick fix. Tip B: Paint your picks! It’s a lot easier for you to see the dark green here for viewing purposes. 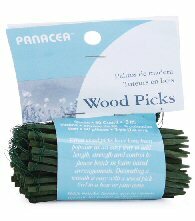 But, you don’t want anyone seeing dark sticks peeping through your bouquet. Want to create a white bouquet? Paint your picks white or silver. Orange? Paint the picks orange, red or gold. You get the idea…blend them in. 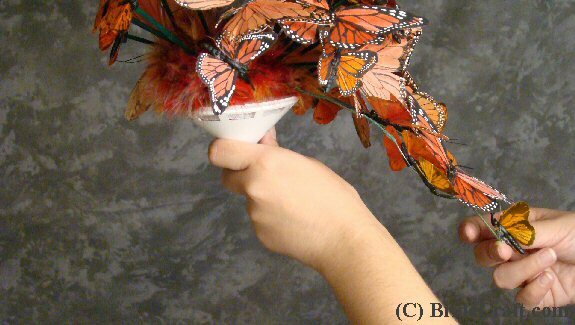 Step 6: Begin forming your butterfly bouquet by placing three butterflies at the “top” of the holder. Angle them so that they make something of an arc. When you are absolutely positive this is where you want them to be, secure the pick at the base with hot glue. 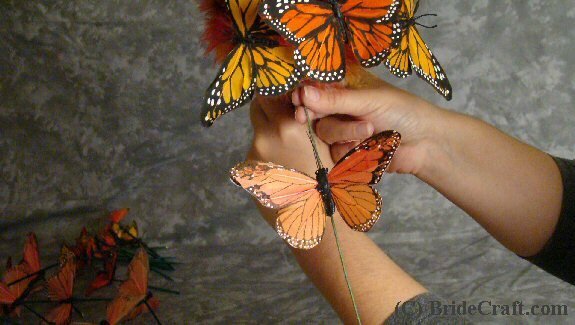 Step 7: Keep building up the shape of your bouquet with the larger butterflies. 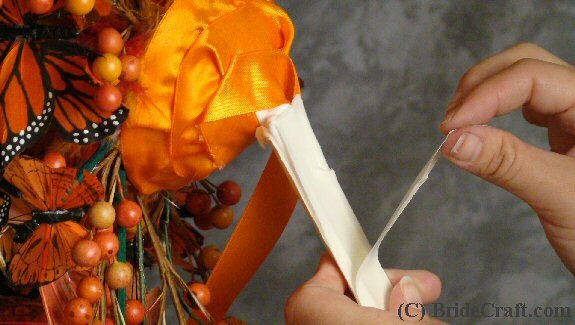 Step 8: Use a piece of cloth covered wire to create the cascading (the tail like) portion of the bouquet. Firmly press it into the Styrofoam . 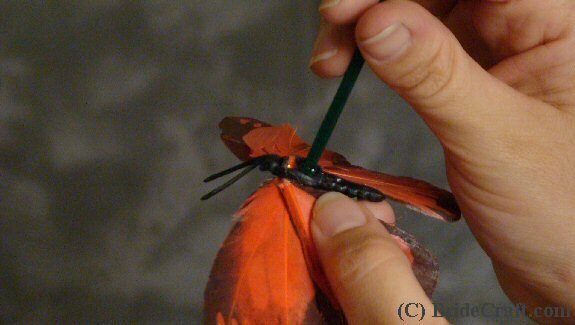 Continue gluing butterflies directly to the cloth covered wire to create your shape. Step 9: When you’re sure it’s in the right spot, secure the base with hot glue. Step 10: You should have a shape somewhat like this now. Step 11: Continue creating the cascading portion of the bouquet. Twist the butterflies back and forth, side ways, etc. Do not attempt to make them look uniform or even! Natural and organic are words to keep in mind when shaping the bouquet. Step 12: Satisfied with the basic shape of the bouquet? Begin to fill in any empty spaces with the smaller butterflies. 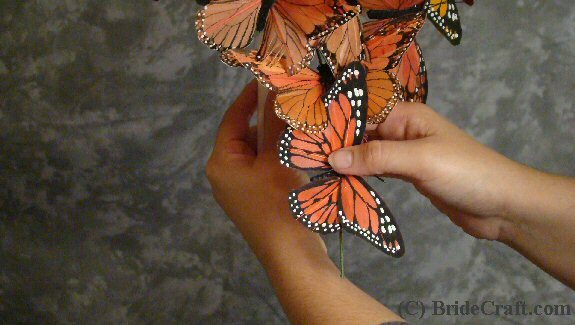 Step 13: Continue the smaller butterflies down the cascade. Step 14: Once the butterflies are set, take your berry picks and cut them into pieces. Carefully select the spaces in the bouquet that need that filling accent. Gently work the berries in between the wings of the butterflies. Secure with hot glue. Step 15: Save a whole berry pick to help fill out the base of the cascade. This will help it from looking to thin. Use your discretion. 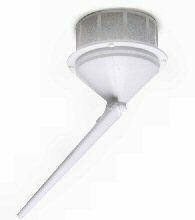 Step 16: You should have something like this now. Tip: Remember, the wired berries can be adjusted as needed. 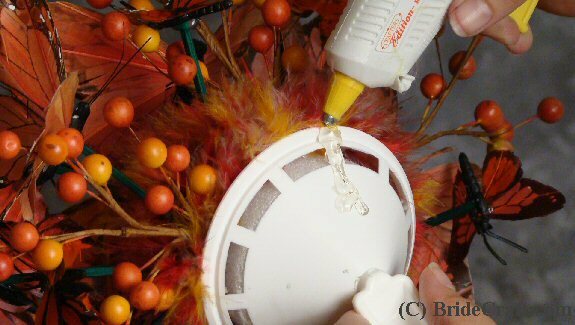 Step 17: Squeeze out a generous portion of hot glue on the back of the holder. Step 18: Quickly apply your ribbon to the glue before it begins to dry. Begin gluing the ribbon to the back of the holder. Tip: Mind your fingers!!! 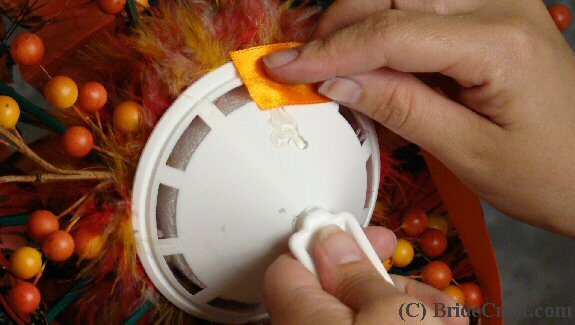 The hot glue can easily burn through the ribbon and singe your fingers. Step 19: Wrap a piece of double sided tape around the handle of the holder. 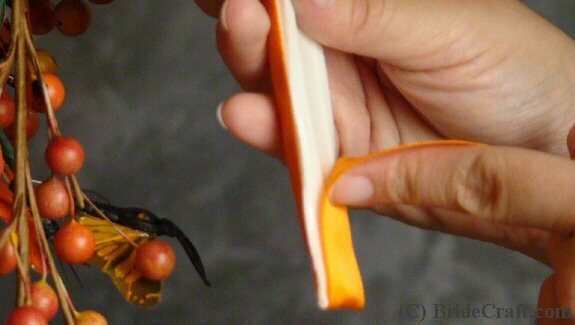 Step 20: Fold the ribbon over the end of the handle first, then proceed to wrap it around and cover the sides. Step 21: Cut the excess ribbon. 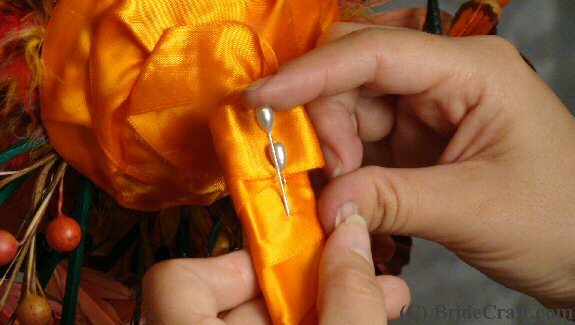 Step 22: Fold the ragged edge of the ribbon under itself, and secure with pearl pins. Tip: Press carefully and firmly. 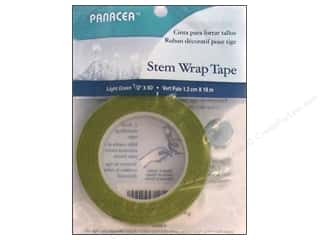 The pins will give resistance as they are being pressed into the double sided tape underneath the ribbon, and not just into the ribbon itself. 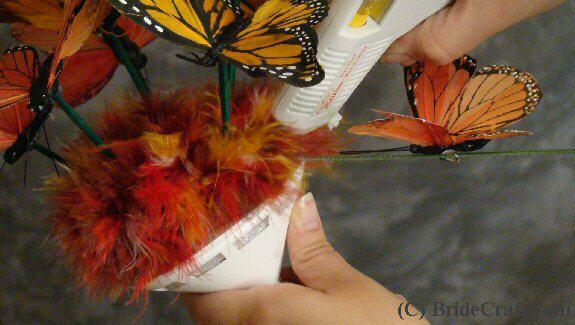 Step 23: Your butterfly bouquet is all done! Enjoy your butterfly wedding.